Alghero ([alˈɡɛːro]; Catalan: L'Alguer, [ɫəɫˈɣe], [lalˈɣe]; Sardinian: S'Alighèra; Sassarese: La Liéra), is a town of about 44,000 inhabitants in the Italian insular province of Sassari in northwestern Sardinia, next to the Mediterranean Sea. Part of its population descends from Catalan conquerors from the end of the Middle Ages, when Sardinia was part of the Crown of Aragon. That is why the Catalan language is co-official in the city, unique in Italy, taking the name of alguerès dialect. The name Alghero comes from the medieval Latin Aleguerium, meaning stagnation of algae (Posidonia oceanica) . Alghero is the third university center in the island, coming after Cagliari and Sassari. It hosts the headquarters of the Università degli Studi di Sassari’s Architecture and Design department. In 2012 it was the 10th most visited city by tourists in Italy. The area of today's Alghero has been settled since pre-historic times. The Ozieri culture was present here in the 4th millennium BC (Necropolis of Anghelu Ruju), while the Nuraghe civilization settled in the area around 1,500 BC. The Phoenicians had arrived by the 8th century BC and the metalworking town of Sant'Imbenia, with a mixed Phoenician and Nuragic population, engaged in trade with the Etruscans on the Italian mainland. Due to its strategic position on the Mediterranean Sea, Alghero had been developed into a fortified port town by 1102, built by the Genoese Doria family. The Dorias ruled Alghero for centuries, apart from a brief period under the rule of Pisa between 1283–84. Alghero's population later grew because of the arrival of Catalan colonists. In the early 16th century Alghero received papal recognition as a bishopric and the status of King's City (ciutat de l'Alguer) and developed economically. Historically, the city was founded in the early twelfth century between 1102 and 1112, when the noble Doria family of Genoa was allowed to build the first historical nucleus into an empty section of the coast of the parish of Nulauro in Judicature of Torres (Sassari). For two centuries remained in the orbit of the Maritime Republics, first and foremost the Genoese apart from 1283-1284 when the Pisans were able to control it for a year. It is plausible that at this time the town shared, given its commercial and multi-ethnic nature, a language similar to the nascent Sassarese. The village was conquered by force by the Crown of Aragon, at the behest of Peter IV d'Aragona, who later actively promoted colonisation of the town and the surrounding area, sending numerous families from different counties and provinces of the then Crown of Aragon, including Valencia, Majorca, Catalonia and Aragon. These were granted enticing privileges, and in fact replaced the original population some of whom were sent to the Iberian Peninsula and Majorca as slaves. The dialects these families spoke in Alghero, were all very similar and derived from the same linguistic family. Over time it settled on its current form of Catalan, despite the subsequent decline of the Crown of Aragon. Alghero today is struggling to retain the use of Catalan, which is a linguistic island and only 10-15% of its inhabitants speak it in it's Alghero variant. The language is recognized by both the Italian Republic and Sardinia as a minority language. Nowadays it is poorly spoken by young people. The city is trying for some time to protect this dialect, through education programs and official use within the local authority. The citizens currently residing in Alghero however, are mostly from the surrounding territories and prefer either the Italian language or Sardinian and Sassarese. Alghero still maintains a small representation at the Generalitat de Catalunya (the autonomous government of Catalonia), without actually having any institutional power in the territory apart from providing assistance to the preservation of Catalan culture. The city, one of the principal of Sardinia and the fifth most populated region, is one of the gateways to the Island thanks to the nearby airport. It is the capital of the Riviera del Corallo, whose name derives from the fact that its waters provide an abundant supply of precious red coral of the finest quality. Historically the processing and sale of the material has been of great importance to the economy and a branch of coral is inserted in the emblem of the city. The Aragonese were followed by the Spanish Habsburgs, who ruled until 1702 and continued expanding the town. In 1720 Alghero, along with the rest of Sardinia, was handed over to the Piedmont-based House of Savoy. In 1821 a famine led to a revolt by the population, which was bloodily suppressed. At the end of the same century Alghero was de-militarised. During the Fascist era, part of the surrounding marshes were reclaimed and the suburbs of Fertilia and S.M. La Palma were founded. During World War II (1943) Alghero was bombed, and its historical centre suffered heavy damage. The presence of malaria in the countryside was finally overcome in the 1950s. Since then, Alghero has become a popular tourist resort. Alghero is located in the northwestern coast of Sardinia, along the bay named after the city. In the north of the urban area there is the Nurra plain, to the NW the karstic systems of Capo Caccia, Punta Giglio and Monte Doglia. The south is built mainly by mountains and the plateaus of Villanova Monteleone and Bosa. The climate at Alghero is mild due to the presence of the sea, which attenuates the temperatures especially during the summer. Summers are warm like in most part of the Mediterranean. Winters are also tempered, with the thermometers showing negative Celsius temperatures just a few days per year. A dialect of Catalan is spoken in Alghero, introduced when Catalans settled in the town. Catalan was replaced as the official language of the Island by Spanish in the 17th century, then by Italian. The most recent linguistic research showed that 24,1% of the people have Algherese Catalan as a mother tongue, which is habitually spoken by 18,5% and taught to the children by 8% of the population, whereas 88,2% have some understanding of the language. Since 1997 Catalan has had official recognition and national and regional laws grant its right to be used in the city. Currently, there has been a revival of the arts in Algherese Catalan, with singers such as Franca Masu performing original compositions in the language. Following a rural exodus from the surrounding villages towards the city, much of the population speaks or has some proficiency in Sardinian, in addition to Italian and Catalan. Historically, the spread of Catalan was limited to the city and part of the coast, as the surrounding countryside has always been populated by Sardinian-speaking people. Moreover, the ancient part of Alghero shows many characteristics of Catalan medieval architecture. The ‘algueresos’ (Alghero inhabitants) usually refer to their city as ‘Barceloneta’ – little Barcelona – because of their ancestry and fraternity with the Catalan capital. 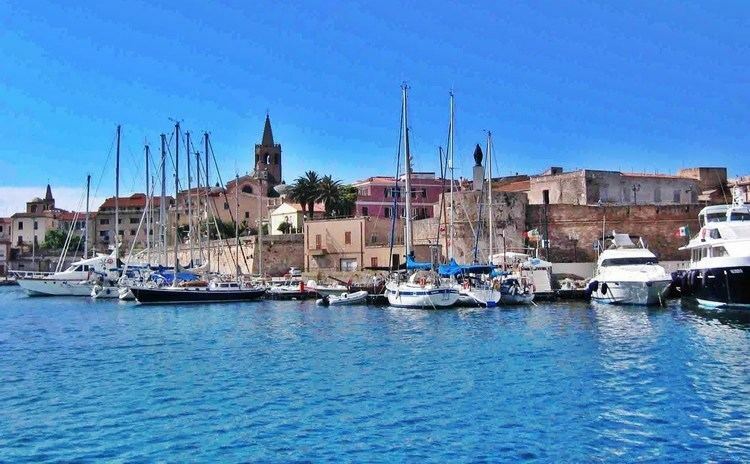 The many historical dominances occurred in Alghero have created a rich variety of monuments, buildings and sights. Back from the Neolithic period from which many settlements remain, up to nowadays, in the last decades Alghero has become a touristic main point not only because of its coast and natural beauties but also because of a fairly well preserved patrimony. Several archeological sites out of the urban area: the Anghelu Ruju necropolis, the Santu Pedru hill, the Villa Romana of Santa Imbenia or even the Purissima. Many nuraghi in some other points as Palmavera are also well preserved and open to visit. The first ramparts system looks back to the 13th century and was imported from the Genovese system. In 1354 the city was occupied by Catalans, who restored and expanded the defensive system, back then in bad condition. Some features from the old walls were respected, but Ferdinand the Catholic, who wanted to grant more protection to the city, built the majority of them in the 16th Century. Along the walls 7 towers and 3 forts are found. Alghero Cathedral (Cattedrale di Santa Maria Immacolata di Alghero) is the seat of the Roman Catholic Diocese of Alghero-Bosa (initially bishopric of Alghero). Construction started in 1570, and although it was opened in 1593, it wasn't until 1730 until it was finished and consecrated. The original church was in the Catalan-Gothic style, as can be seen in the five chapels of the presbytery, which also include the base of the bell tower. The nave and the two aisles are of late Renaissance style. In the 20th century a Neo-Classical narthex was added to the façade, radically altering its appearance. The church of St. Francis (1360, rebuilt in the late 16th century). Original Catalan-Gothic parts can be seen over the high altar, the presbytery chapels and the San Sacramento Chapel. The bell tower is from the first half of the 16th century. The church of St. Michael. The Madonna del Santo Rosario. The Torre del Portal, built at the expense of the Jewish community in Alghero in 1360, and the Tower dell'Esperò Reial (16th century). Palazzo D'Albis (16th century), a typical example of the Aragonese architecture of the 16th century. In October 1541 it housed the Emperor Charles V.
Neptune's Grotto, a large cave discovered in the 19th century. The coral of Alghero, is known as among the finest in the Mediterranean and the world for the particular reputation of quantity, quality, compression and the ruby red color, much to remember one of the most important economic aspects of the territory, also called the Riviera del Corallo, and have in his coat of arms a branch of the precious red coral on a foundation of rock. For the particular combination with the jewelery and goldsmith craft is also called red gold so much so that it is sold at the same price of the precious metal. Another of Alghero features is its landscape. It has several beaches, bays and natural parks on the shoreline. Capo Caccia promontory and its lighthouse are landmarks. Alghero is well-connected. Roads lead to Sassari, the province’s capital. The main port for passengers is 30 kilometers away and Alghero – Fertilia airport has national and international flights. Strada statale 127bis Settentrionale Sarda, leading to Porto Conte (north) and Sassari (east). Strada statale 291 della Nurra, from Fertilia to Sassari. Strada provinciale 42 dei Due Mari, reaching the port in Porto Torres. Strada provinciale 105 Alghero-Bosa, panoramical road, it starts in the southern part of Alghero and goes along the shore to Bosa. Strada statale 291 dir del Calich, assuring the connection to and from the airport. Alghero has a train station in the Pietraia neighborhood, Sant’Agostino, with daily trains to Sassari. There is a pleasure and fishing port in the heart of the city. Passenger traffic is handled by Porto Torres, some 30 kilometers north. There are ferry services from there to Genoa, Barcelona and Civitavecchia. The Alghero-Fertilia "Riviera del Corallo" Airport is 10 kilometers from the centre near Fertilia. It’s the principal connection with the rest of Italy and Europe. There is hourly bus service to Fertilia and the centre of Alghero. In the 1930s the Swedish writer Amelie Posse Brazdova wrote a book entitled Sardinia Side Show, where she told the complete story of two years she spent "interned" in Alghero old town during World War I.